If you are planning a birthday party for the hip-hip fan in your life and aren’t sure if all the guests will enjoy it, don’t worry. The music that emerged from the Bronx in the 1970s is part of American culture -- world culture for that matter. “Not since the advent of swing jazz in the 1930s has an American music exploded across the world with such overwhelming force,” wrote James McBride in “National Geographic” in 2007. Seven years later much of hip-hop's language, music and dance moves are mainstream. Whether you recruit a DJ to scratch and loop and a MC to rap or you plug a MP3 into the speakers, your party can both celebrate the birthday a music culture that, like jazz, originated from America’s roots. Create invitations that resemble backstage VIP passes to a hip-hop concert. Include the guest's name and a fake bar codes. Laminate the passes or tuck them into ID badge holders. Include a custom message that indicates whose birthday is being celebrated. Another fun idea is to make invitations that look like vinyl records. Create a nightclub feel for your party. Cover the walls of a large room with black paper or fabric, strings of white lights and neon signs. Another idea is to cover a wall or table with butcher paper and recreate the New York City skyline, complete with glow-in-the-dark stars. Or invite guests to create a customized "happy birthday" graffiti wall with markers and butcher paper. Old vinyl records can also adorn the walls. Consider sprinkling large fake diamonds around the tables and include a red carpet for a hip-hop party with bling. Hire a DJ or play your favorite hip-hop music for guests to dance to. Consider having a dance contest that features different styles of hip-hop, such as street, freestyle, and break dancing. Put a few beats together and allow your guests to battle against each other with their own original free-flow rhymes. 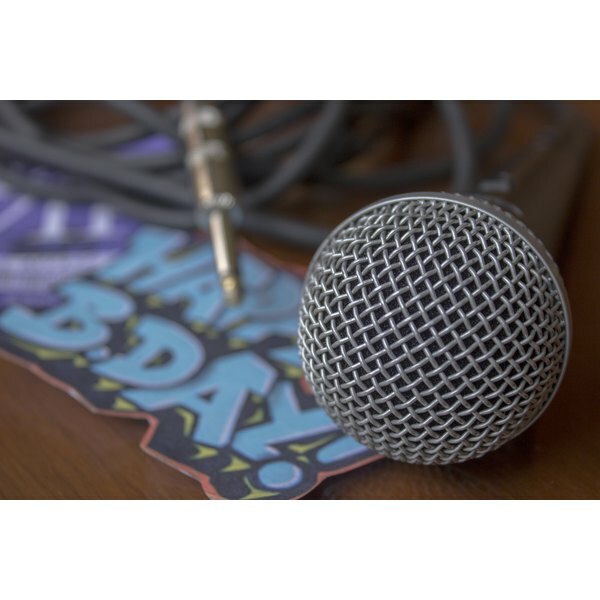 Celebrate old-school hip-hop by asking guests to try beatboxing, that is vocal percussions, as well. Decorate serving dishes with "happy birthday" painted on them in a graffiti style. Serve punch in Champagne glasses with glow-in-the-dark neon ice cubes. Keep snacks out in crystal dishes for a bling party. Decorate the cake to look like an old boom box or DJ turntables. Provide hip-hop themed party favors, such as sunglasses, dog tags, fake diamond earrings, chains, CDs or gift cards for music downloads.